Will the Magazine be available on Newsstands or in Bookstores? At this stage no – we need subscribers and circulation before they’ll consider it. The only way to get the magazine is to buy it directly from us from this storefront. Yes, if you want to pay via check or if you have issues with our cart system, simply print this form and mail your payment in. How many pages is the Anglotopia Magazine? The Anglotopia Magazine is 64 pages right now. What is the trim size? 8.5 x 11”. It’s perfect bound like a book. Shipping to the USA and Canada is FREE for subscribers. Shipping to everywhere else depends on your country, it is reflected in your checkout cart. It’s very expensive to mail a magazine all over the world, there’s nothing we can do about that. But we think it will be worth it! Is there a free gift for subscribing? Yes, print subscribers will receive a free digital copy of our Slang Dictionary. Digital subscribers will receive a free Digital Version of the slang dictionary. You will receive the book with your first issue. What format is the Digital Version of the Magazine? It is in Adobe PDF format. It’s a high resolution PDF so the file is large. It looks great on all tablets. As for how to get it on your tablet, that’s something you’ll have to lookup but it’s pretty easy. Just Google ‘load pdf onto (insert device). When will I receive the print version? You will receive your magazine 2-3 months after your order. There will be 4 issues in 2017, shipping approximately quarterly (we don’t know the dates yet). We accept all major credit cards or Paypal. If you want to pay via check or if you have issues with our cart system, simply print this form and mail your payment in. How will I receive future digital issues? You will receive an email from us with the link to download the latest issue so make sure not to mark us as SPAM. How Many Issues in a Subscription? We publish four issues per year, quarterly. Each issue is 64 pages of articles and pictures. NO ADVERTISEMENTS. At least 20,000 words of text and dozens of licensed images. Will the articles appear on the website for free? Most of them, no. Some of the bigger feature ones we may share but it will be 6-12 months AFTER publication in the print magazine. 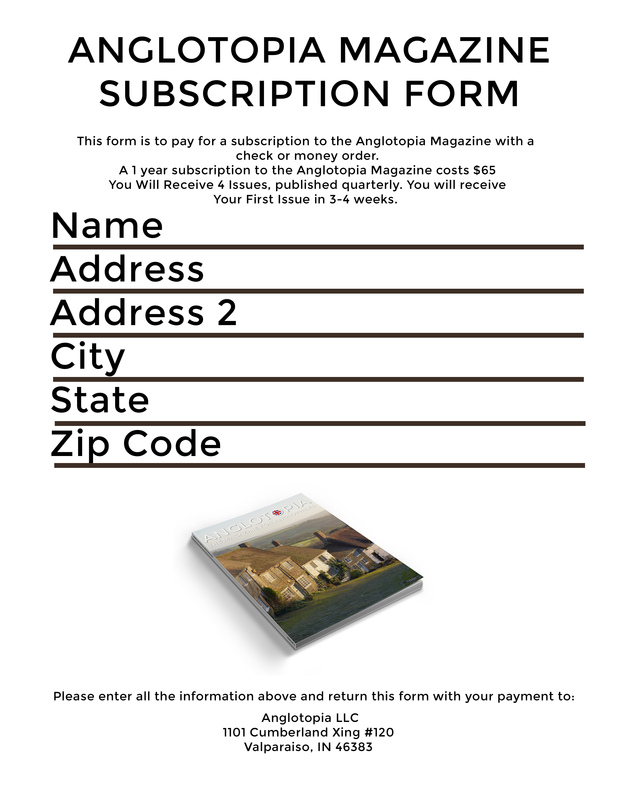 The print magazine has established its own identity separate from the website Anglotopia. How to Change Your Address? Please email us or use our contact form to update your address. Updating it in your account on the Anglotopia Store will not automatically update it to our shipping system – we have to do it manually! Is the London Annual Included in a Subscription? The London Annual is produced outside the magazine subscription and it WILL NOT be included with your regular print subscription. We launch the London Annual in the Autumn for the next year, so keep an eye out for when to order it. No other special issues will be included with your subscription either. Generally, no. We order just enough printed to satisfy subscribers and pre-orders plus a few extras for straggler orders. We always sell out. Our magazine is still a small print run magazine, so it’s very expensive to print, so we are limited in how many we can order. Sometimes we have extras but they usually sell out (except for Issue #3 for some reason, we can’t seem to get rid of the extras!). If you want to ensure you receive every issue, subscribe or pre-order as each issue is announced. Digital Back Issues will be available at all times, however. When and how do I renew my subscription? You will start getting renewal notices 90 days before your subscription expires. You must renew in that time period to get your 5th issue. We do not operate like traditional magazines where we’ll just keep sending it until you cancel. We’re too small to do that. YOU HAVE TO RENEW to keep getting the magazine. You will only be notified by email to renew, so make sure you check your emails regularly.